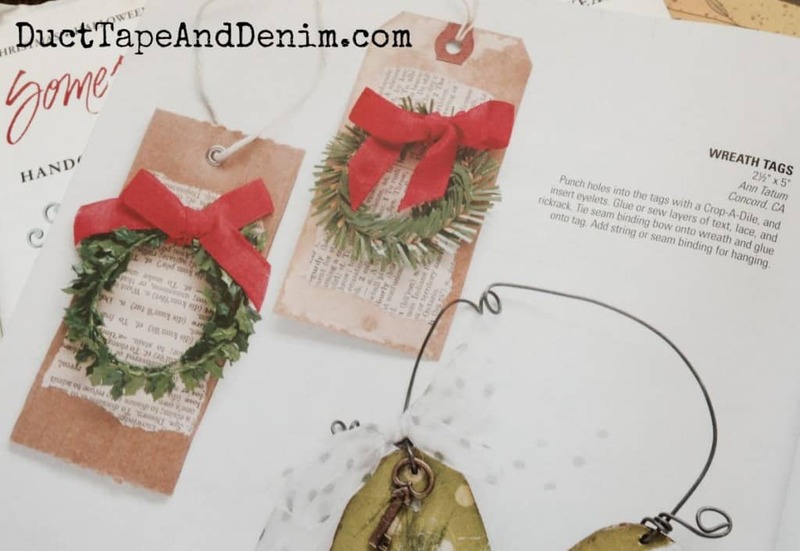 Today I’m sharing some of the wreath Christmas gift tags that I started making a few years ago. 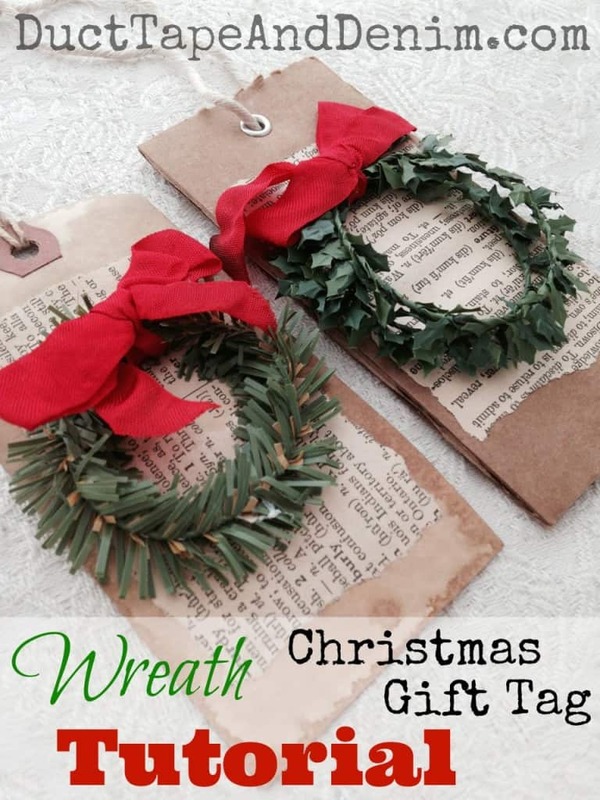 These are a bit easier than the candy cane gift tags that I shared last week. You don’t need a sewing machine for these. I actually make two variations of this. One on a shipping tag (on the left) and one with leftover cardboard (on the right). 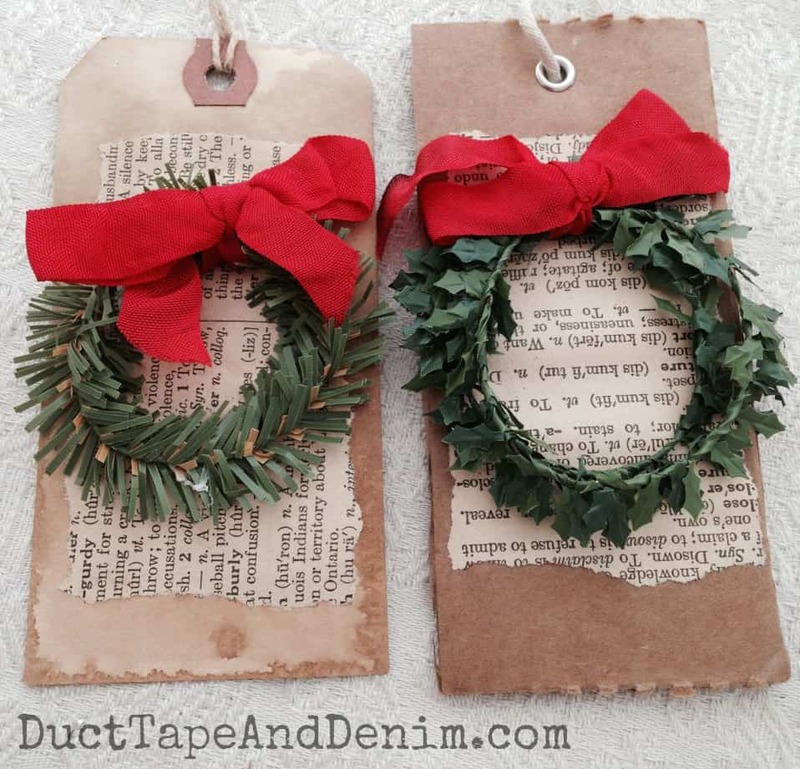 They’re both pretty easy to make so get out your supplies and enjoy some Christmas crafting! 1. Dip the shipping tag in some cooled, leftover coffee. If you prefer, you can rub the edges on an ink pad. Or you can do both. 2. Cut your chenille stems in half and form into a circle, overlapping the ends just enough to tie some red seam binding around it. Tie a bow. Trim the ends. 3. Rip the vintage book pages to fit your tag. Use a glue stick or craft glue to attach. I smooth mine with a bone folder but that’s optional. 4. 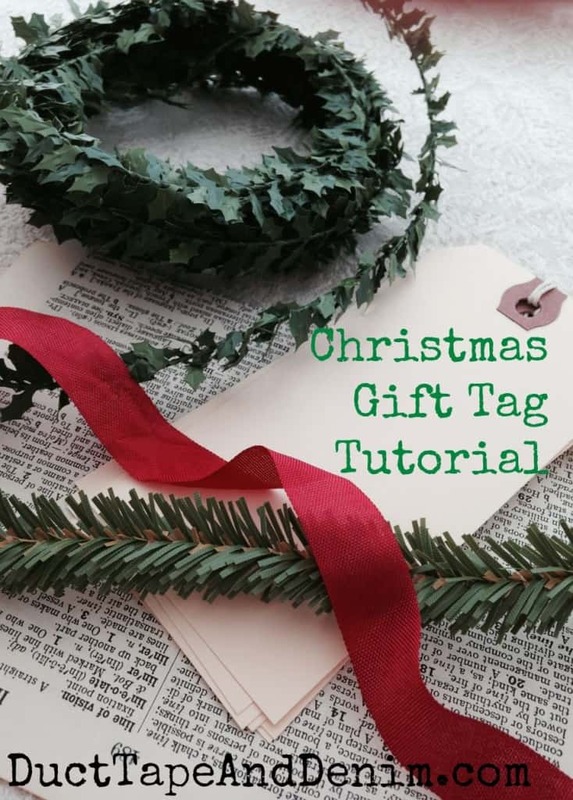 Glue the wreath to the tag and let dry. The cardboard tags are done just the same except that I used my crop-o-dile to punch a hole and attach an eyelet. Then I added a string tie. The photo on the left is from when Stampington magazine published them! That was exciting… I always like seeing my projects in magazines! If you’re ready to make more Christmas projects check out my DIY | Christmas crafts and DIY board on Pinterest. You can also find more of my tutorials by clicking on “Tutorials” under my “DIY” tab at the top of this page. Love how classic these look…gorgeous for a brown paper wrapped package! Thanks for sharing with us this week at Monday Funday!! Super cute gift tags. I love their vintage feel! Thanks for sharing! PINNED! I love the gift tags, very cute!! These are absolutely darling! Pinning! Thanks for sharing at my Creative Ways Link Party! Looks great.. what a fantastic idea!! Pinned it! Your idea is very unique and amazing in fact too simple too made. I love this and I will definitely try this. Thanks for sharing this amazing and beautiful blog.